From the moment you enter this condo there is peace. 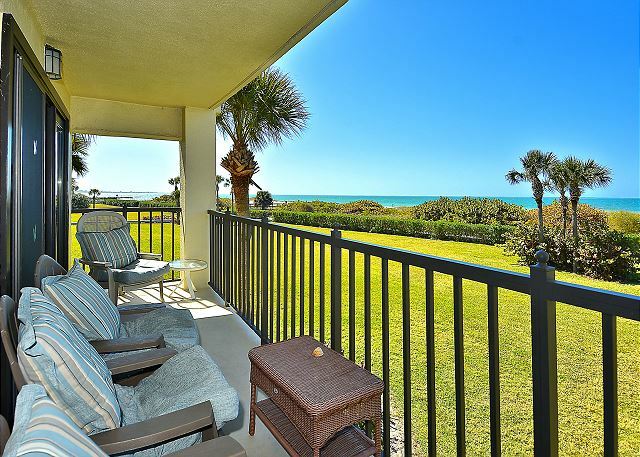 Standing in the entryway, the Gulf of Mexico is in your sights. Well appointed with a nautical beach house theme throughout, this condo also offers a very well equipped kitchen, wide balcony for sunset and dolphin watching, not to mention a scrumptiously comfortable king bed in the master bedroom. Land's End has and always will be our winter escape with its immaculate grounds, heated pool and guarded entry. We have been renting from Resort rentals for many years they are in a great location, very helpful and always available. The property we stayed at is wonderful. Our actual condo this year could use a good cleaning walls and doors were dirty. Other than that it was a great stay. overall our stay in 209 was a good experience. However this unit could use a thorough cleaning. Thank you for your feedback and we will be sure to provide this to our housekeeping department. Thank you for choosing to stay with us and we hope to have you back for future visits. This is our 14th year that we've rented condo's at Lands End. We meet family members from across the US and have a family reunion. It's our favorite family summer vacation destination. We love it!!! It is so special that you all meet at Land's End each year for your family vacation, what great memories!!!! Thank you so much for choosing to stay with us for your accommodations at Land's End, we always enjoy having you and look forward to having you back again next summer!! We keep coming back- been visiting Lands End for 17 years. We have been coming to Lands end for 17 years now. The place is perfect. You are actually on the very tip of Treasure Island so you have perfect beaches that are never over crowded. The grounds, pool, and amenities are impeccable. We have lately made this our gathering place for family reunions. Everyone gets a Condo or two and we catch up. Also, the grandkids, the nieces and nephews get see and play with one-another. It is just perfect. Near to great restaurants, water sport rentals, and fishing charters. LE is just a short drive to Bush Gardens and a doable distance from Universal Studio's. Thank you so much for this nice post and the kind words about our staff and agency! :-) We just LOVE that Land's End is the perfect family gathering spot for your family, that is just awesome to hear!!! With the amenities on site, the safety of being a gated community, the location and beach really is an ideal family vacation spot, we agree!!!! :-) Thank you so much for choosing to stay with us at Land's End and as always, we look forward to your return visit! Thank you so much for this nice post and the kind words about our staff and agency! :-) We just LOVE that Land's End is the perfect family gathering spot for your family, that is just awesome to hear!!! With the amenities on site, the safety of being a gated community, the location and beach area; it really is an ideal family vacation spot, we agree!!!! :-) Thank you so much for choosing to stay with us at Land's End and as always, we look forward to your return visit! Wonderful!! :-) We are so glad you were comfortable in this premier beachfront condo at Land's End and that you enjoyed the community as a whole! Thank you so much for choosing to stay with us and we look forward to your return visit!! Very desirable condo; southern decor; updated kitchen and bathrooms. Wonderful sunset beach location. $$ well spent. December 2018 return date! Highly recommended. A great family rental, with access to the beach and pool. Very secure. This is a very well maintained and comfortable condo. We had a great time! We are so glad you had a good family vacation and enjoyed this premier condo at Land's End, it really is lovely!! :-) Thank you for choosing to stay with us and we hope to have you back for another beach getaway soon!! We've stayed at Lands End 3 or 4 times now. The property and grounds are always well kept and we like the fact that it's a gated community. Pool always inviting! This condo was lovely and had everything a family of 4 needed. The only negative was the dryer vent was in really bad shape and the garbage disposal didn't seem to work. Small issues that didn't effect our stay. Thank you for this post! We are so glad to hear you enjoyed this premier condo in our program, it really is very nicely done!! :-) We do apologize for the dryer vent and garbage disposal problems you had but thank you for letting us know. Please never hesitate to call us at our office while you are here and we would be happy to have our maintenance come out and address this for you. We want you to be totally comfortable during your stay so let us know if there is anything that we can do to help with that! Thank you for being our guest and we look forward to your next Land's End getaway!! Lands End was perfect for my family. Having a little one, we enjoyed the little bit of seclusion the Lands End offers by being at the end of the island. The unit was great, clean, comfortable, and peaceful. The beach was so nice and not crowded at all. If we come back to treasure island, we will be back to Lands End and this unit! We are glad you enjoyed your family vacation at Land's End in this premier condo! Being a gated community at the end of the island does offer that security and seclusion and we are glad you enjoyed that aspect of this location! :-) Thank you for being our guest and we hope to have you back to our area for another visit in future! We had a great vacation on Treasure Island. It was our first stay in the area, but it will not be our last. We stayed at the Land's End. The property was secure and immaculate. The pool was perfect and it was just a short walk to the beach. We watched the sunset every evening from our balcony. I highly recommend Resort Rentals and Land's End. Thank you so much for this post and shout out to us and Land's End!! :-) We are so glad to hear you enjoyed this premier condo and your time here, it really is such a great location! Thank you for being our guest and we look forward to your next visit to Treasure Island!! Our rental unit was an exceptionally well maintained condo with a beautiful sunlit living and dining area looking onto the lush lawn and ocean. The area is very quiet and less commercialized, although there are two little eateries/bars within walking distance. We were right next door to the pool. 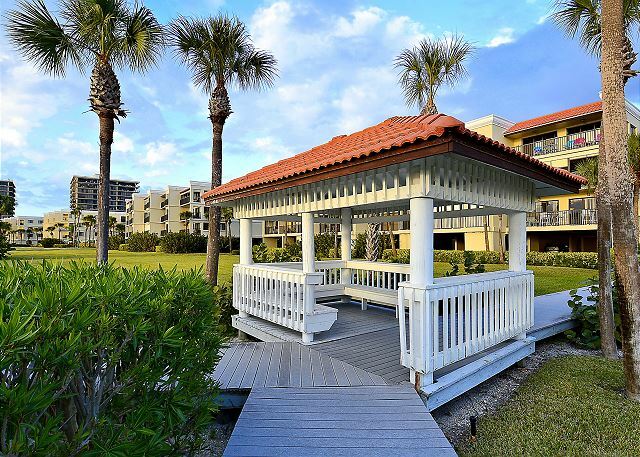 The front gate supplied us with shuffleboard and volleyball gear and the condo owners had several beach chairs, umbrellas, paddle ball, and a wheeled cooler for beach use. The master bedroom's bed was ridiculously comfortable, although the 2nd bedroom's twin beds were literally like lying on a concrete slab. Fortunately, the pull our sofa took their place for our adult daughters. Overall, this was an exceptional rental and we enjoyed our time there. Amazing experience front start to finish! Service issues- easy & fast to resolve!?? Overall experience- A definite book again! Loved the condo. Great location. Fairly private. Beautiful weather. 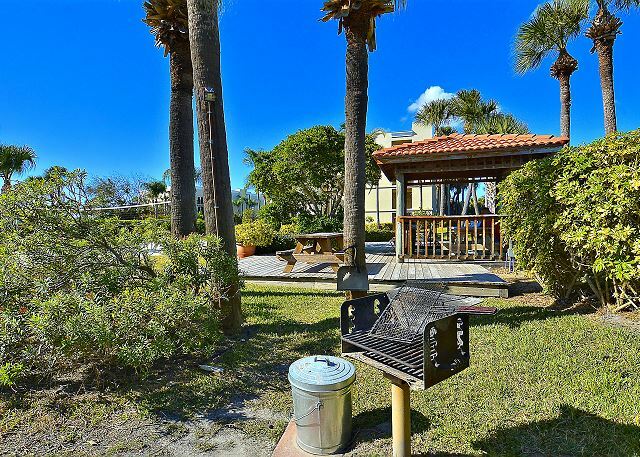 clean open updated beach side decor with updated kitchen and bathrooms extend comfort to those of home. Sunset watching on full balcony round out sun filled days. Surely a premium condo. The location was really near the beach, we had a look of the sunbreake from our balcony ever evening.There was everything you need for the stay. Beautiful unit, well run complex and nice people! complex, family friendly with a beautiful beach and pool area. This is our eighth stay in the past 15 years. Never had a bad experience. We had a great stay. Lovely condo and property! It was fabulous! The unit we stayed in was perfect for our family. The beach and the pool were fantastic! Counting down the days until we return next year! We have a great week-long stay here end of May. Our condo was excellent (Building 9, Unit 201). The people are friendly and the location is perfect. this condo complex and the condo itself are terrific! You can't get a better view! We stayed at Land's end Blgd. 9 #201. Our condo looked out at the gulf- beautiful to wake up to every morning and wonderful sunsets on the beach in the evening. We have stayed at Land's End 4 times and loved it every time! We'll be back!! Wonderful updated condo.Well kept.plenty of linens, dishes, even a few beach chairs and umbrellas left by others...that's a pleasant surprise as we love the beach . A ding size table on balcony would be a nice amenity;)? A Winter Break to Remember! My family and I have came there for the first time and we loved it. It had a beautiful view to the beach and the ocean. The pool was always warm and comfortable to vacation at. And the Condo its very clean and ready for a family to feel comfortable and enjoy there vacation when they walk right into the room. And every time when my two daughters used to go outside and go onto the beach they always saw dolphins while they were on the beach. And you could have seen them on the beach from the room. It was always a beautiful view to see the sunset every evening and the sunrise every morning. I would definitely recommend this condo to a friend. Thank you for the wonderful experience and vacation. 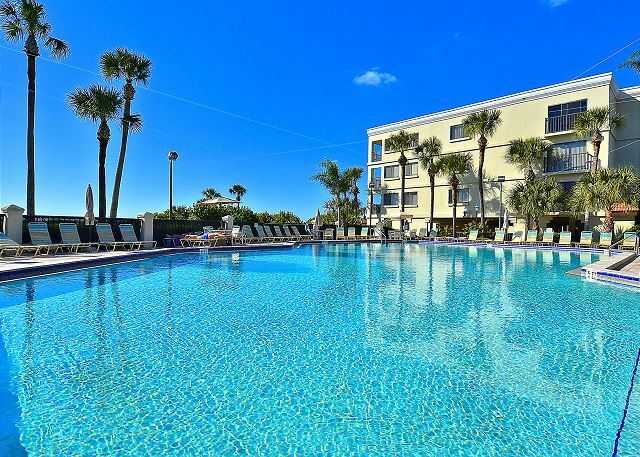 Unit 9-201 which was recently remodeled and updated is the place to stay, both in terms of condition, size and proximity to the beach walk and pools. Hard to get unit but if you can, you win. Almost perfect. The mattresses were hard and though not awful, on a unit this nice, could stand an upgrade, if only in the Master bedroom. A tempurpedic or at least a topper perhaps! *****Update***** A new mattress has been purchased for the master bedroom! Thanks for your review! The weather did not cooperate at all. But, we had a relaxing and enjoyable time. to this same unit next year. Resort Rentals were most cooperative with trouble free arrival and departure arrangements.